Falvey Memorial Library :: Piketty for All! 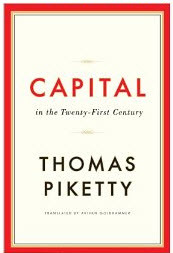 Talk of Thomas Piketty’s book “Capital in the Twenty-First Century” is everywhere. Only time will tell if his ideas are simply enjoying 15 seconds of fame or if they genuinely capture the zeitgeist. It’s rare for an economist to enjoy such celebrity and even rarer for the library to be able to make books immediately available to all. Well, almost all… Anyone with an iPad, android tablet or reading device or laptop can borrow a copy of Piketty’s book from the library website. Before reading you’ll need the Bluefire Reader app (for iPad or Android) or Adobe Digital Editions (for laptops) and to createa user name and password and sign into EBSCOhost. E-books on this platform are only compatible with Kindles if you are willing to download individual chapters and are not bothered by heavy text obscuring watermarks.